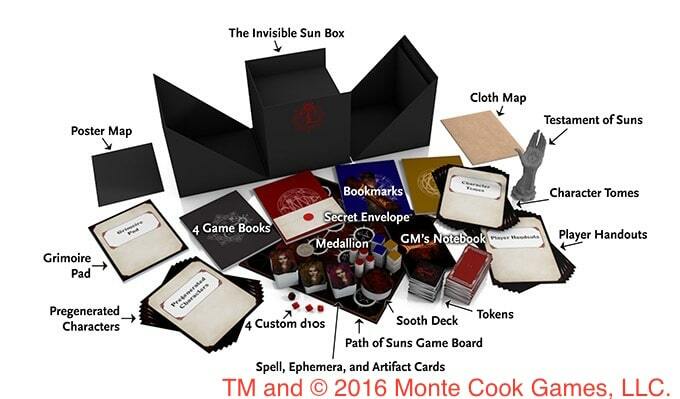 I speak of “Invisible Sun,” the new Kickstarter from Monte Cook Games announced at Gen Con 2016. MCG is noted for “Numenera,” “The Strange” and “No Thank you, Evil” role-playing games, but IS is completely different from those earlier offerings. The basic premise is the “real” world is a gray shadow of the Actuality, a surreal, magical world that “Vislae” came from. Vislae being the player characters. A great war forced many from the Actuality to flee to Earth and forget their origins. “Invisible Sun” is a game about secrets as the players learn about their origins, secrets of the Actuality itself and the greater universe. When I said “ambition” I meant both in physical size of the game and its depth. Starting with the physical elements of the game, take a look at the contents of the box. This is just the basic game, it does not include any of the completed stretch goals. Those are listed below. There is an ocean of stuff in the box, but the key element for me is the “Directed Campaign.” Several times per year the GM will receive props, documents, advice from Monte himself and other items to augment your campaign. Even the individual players receive packages with campaign related items. There are rules for running a game at a table, or on a one-on-one basis while walking in a park. They integrated a web-based application to resolve actions between in-person game sessions. There are specific rules for flash-backs and non-linear storytelling. IS is, in a word, deep. “Invisible Sun” is a game about learning and using secrets and to that end MCG is running an alternate-reality game during the Kickstarter that includes physical geocaches to find in the real world, complex puzzles to solve and promises the game components are themselves elements of a larger puzzle. I suggest you join the “Invisible Sun” Google+ group if you are interested in the ARG, as they are on the cutting edge of solving the puzzles. Is $539.00 a lot of money? Absolutely, but I think the value far outweighs the initial cost. The Directed Campaign runs for a year and $50.00 per month is a bargain rate for some quality game nights complete with props and other goodies arriving during the year. Some game groups are pooling resources to get the upgraded game. That said, there is a $197.00 level that includes the base game, but no stretch goals or Directed Campaign that is cheaper, but still gets you the game. Oh, sometimes they have “keyfall,” an in-game event that is part of the Kickstarter. At irregular intervals some new backer levels become available with some extra benefits for the same price. 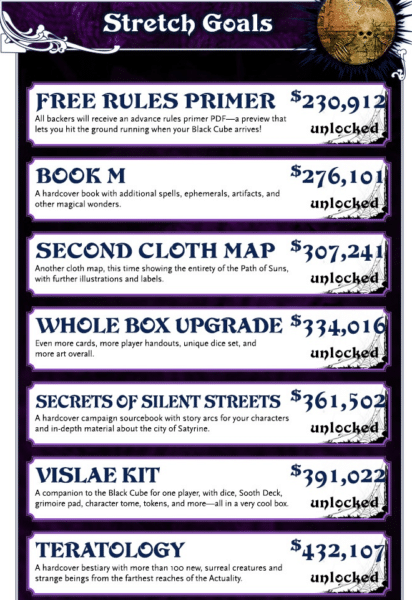 So “Call the Black Cube” cost $197, but “Call the Black Cube with Key” is also $197.00, but comes with some extra key props. Watch the MCG twitter feed for these special events. I truly believe that “Invisible Sun” is the most ambitious RPG product I have ever seen, in both construction and depth and I am excited to be a supporter. Join me in the light of the Invisible Sun.